Download "Effect of polya problem-solving model on senior secondary school students performance in current electricity"
1 European Journal of Science and Mathematics Education Vol. 3, o. 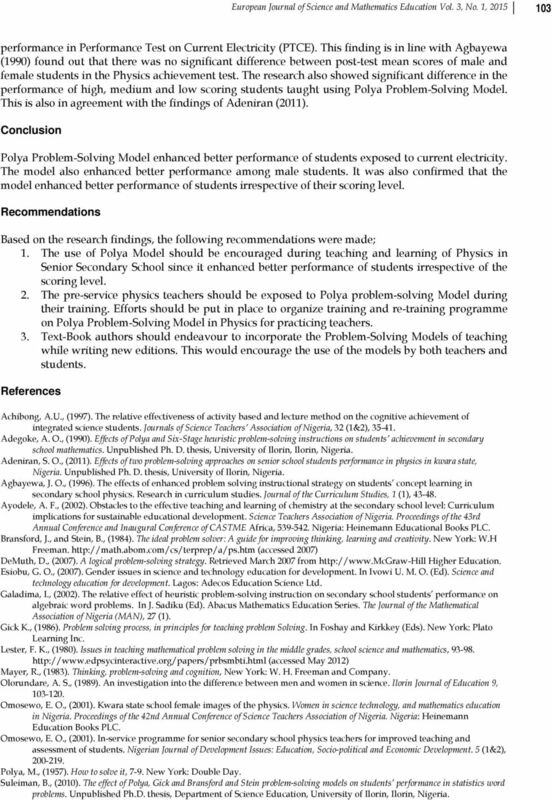 1, 2015, Effect of polya problem-solving model on senior secondary school students performance in current electricity Olaniyan, Ademola Olatide 1*, Omosewo, Esther O. 1, wankwo, Levi I Department of Science Education, University of Ilorin, Ilorin, igeria 2. Department of Physics, University of Ilorin, Ilorin, igeria. For correspondence: Abstract: This study was designed to investigate the Effect of Polya Problem-Solving Model on Senior School Students Performance in Current Electricity. It was a quasi experimental study of non- randomized, non equivalent pre-test post-test control group design. Three research questions were answered and corresponding three research hypotheses were tested in the study. The study was performed in Ilorin metropolis in Kwara State igeria, making use of two schools purposively selected. Sixty Senior Secondary School Two students were used in each school, making a total of One hundred and twenty students. The experimental group was exposed to Polya Problem-Solving Model while the control group was exposed to Lecture method. The two groups were pre-tested and post-tested using Performance Test in Current Electricity (PTCE). Data collected after Six weeks were analyzed using mean, standard deviation and analysis of covariance (ACOVA), the hypotheses were tested at alpha level of The findings showed that students exposed to Polya Problem-Solving Model performed better than those exposed to Lecture method. The educational implications of the study were highlighted and recommendations were made. Keywords: Problem-Solving, Polya Problem-Solving Model, Performance Test on Current Electricity, Gender, Scoring Level. Introduction Science and Technology have become the major ingredients of economic and national advancement. Science and Technology influence every aspect of our lives. They are centrals to our welfare as individuals and society at large. The position and prestige of a ation in world politics depends on the extent to which the country advances in science and technology. Omosewo (2006) defines Science as an activity which results into a testable, falsifiable and veritable body of knowledge. It accelerates the pace of change in the world by providing the foundation for wealth and development and brings improvement to the quality of life. Physics as one of the basic natural science subjects plays a vital role in advancement of science and technology. Today Physics has two sides; on one hand, it provides the basis for our current world picture, while on the other hand it is the foundation of other subjects for technological developments. Of the three core sciences; Biology, Chemistry and Physics, Physics holds the strongest position as a major subject prerequisite into career in science and technology (Esiobu, 2007). Physics is a branch of science that deals with energy and their interaction (Omosewo, 2006). It is sometimes referred to as the science of measurement and its knowledge has contributed greatly to the production of instruments and devices of tremendous benefits to the human race. Physics provides the basic knowledge and understanding of principles, whose applications contribute immensely to the quality of life in the society. There exists a strong link between progress in physics and technological advancement of the society. It provides the theory behind technology and it is the foundation of any theoretical and applied knowledge. Physics is considered essential to give evidence of the students success in Medicine, Engineering and other sciences like Chemistry, Anatomy and Cosmology. For physics to retain its position as bedrock of science and technology, it is important to ensure that the way it is being taught interests igerian students. 2 98 European Journal of Science and Mathematics Education Vol. 3, o. 1, 2015 Teaching involves both the teacher and the students in the transfer of knowledge in the classroom. For teaching and learning to be done in a classroom setting, it is important to ensure that the two-way communication channel exists between the teacher and the students. Students are expected to develop cognitive and practical skills that will enable them to apply their knowledge to explain phenomena that happen around them and to solve the problem. The desired goals are yet to be achieved among students instead the teaching-learning situation has largely neglected the higher objectives of education, which are the development of the cognitive critical thinking skills and the affective domain. The effect of this is that students were found to be deficient in cognitive and critical thinking skills, when they are faced with situation where they are expected to apply what they have learnt to solve specific problem. Ayodele (2002) opined that what was learnt by students was a function of how it is taught. Successful science teaching requires that the student make sense out of what they are taught. The traditional method of teaching means that the teacher stands in front of the silent group, while the students listen quietly during teaching. It is important for teachers to learn how to use teaching method that encourages scientific processes and other desirable scientific attitudes. One of the ways by which this could be done is adopting teaching method which encourages problem solving strategies. Problem solving is a process which begins with the initial contact with the problem and ends when answer is received in the light of the given information. Galadima (2002) in Suleiman (2010) stated that Problem solving is a complex process to learn, it consists of series of tasks and processes that are closely linked together to form what is called set of heuristic, pattern. He defined heuristic as set of suggestions and questions that a person follow and ask himself in order to resolve a dilemma. Students need to learn this process if they are to deal successfully with problems they are to deal successfully with problems they will need in school and real life. Mayer (1983) defined problem solving as a multiple step process where the problem solver must find relationship between past experience and the problem at hand and then act upon a solution. The definition is based on inclusion of complex set of cognitive, behavioral and attitudinal component in problem-solving. In research works carried out by Agbayewa (1996), Olorundare (1989), Achibong (1997), Omosewo (2001), Wokocha (2002), Olaniyi (2004), Adesoji (2008), Sulieman (2010) and Adeniran (2011), it has been stated that methods of teaching affect the performance of students in physics and other mathematics related subjects. The trend of students performance in physics over the years has been poor; hence the need for an activity based approach to solving problems in physics. Problem-solving models in sciences and mathematics are many. Different research works had made use of the problem-solving models to solve specific problems in order to improve on performance of students. Among which we have Polya (1957), Lester (1980), Gick (1987) and Demuth (2007). George Polya model (1957) is one of the earliest problem-solving models. The model comprises of four main stages. i. Understanding the Problem ii. Devising a plan that will lead to the solution iii. Carry out the plan iv. Looking back Different research had been carried out on effects of the problem-solving models on students performance in mathematics and a few in physics among which we have Adegoke (1990) who found that Lester (1980) model was preferable to Polya (1957). Suleiman (2010) found that Polya was preferred to Gick problem-solving model and Bransford and Stein (1984). Adeniran (2011) found that students exposed to activity based approach of Physics Specific Problem Solving and Target Task performed better than those exposed to lecture method. This study focuses on effect of Polya Problem- Solving models on students performance in current electricity concepts in senior secondary school physics curriculum. 4 100 European Journal of Science and Mathematics Education Vol. 3, o. 1, 2015 two hours and the questions were retrieved from the students immediately after the test. Students were taught the selected concepts from current electricity for a period of four weeks, two periods per week with each period lasting for forty minutes. Post-test which lasted for a period of two hours was administered at the sixth week in the respective schools. Data Analysis and Results The results are presented according to the research questions and hypotheses. Research Question1 What is the difference between the performance of students taught with Polya Problem-Solving Model and those taught with lecture method? Table 1. Scores of Students in Performance Test on Current Electricity Based on the Instructional Models Treatment Scores Pre-Test Scores Post-Test Scores Gain Scores Polya Lecture Standard Deviation Standard Deviation The table presented the mean scores of students exposed to Polya model and lecture method. The pretest mean score of experimental group is and standard deviation is while pre-test mean score of control group is and standard deviation is The post-test mean score of experimental group is and standard deviation is while post-test mean score of control group is and standard deviation is The difference between mean gain score of students exposed to Polya model and lecture method is Hypotheses 1 There is no significant difference in the performance of students taught using the Polya Problem- Solving Models and those taught with Lecture method in Performance Test on Current Electricity. Table 2. Analysis of Covariance of Post-Test Score of Students Exposed to Polya Problem-Solving Model and Lecture Method in Performance Test on Current Electricity (PTCE) Source Type III Sum of df F Sig. Squares Square Corrected Model a Intercept Pretest Treatment Error Total Corrected Total The result in table 2 showed the P value (.022) is less than P alpha level of 0.050, (P < 0.050). This suggests that the Hypothesis HO 1 was rejected. There was significant difference in the performance of students exposed to Polya, Problem-Solving Models and Lecture method in Performance Test on Current Electricity. 5 European Journal of Science and Mathematics Education Vol. 3, o. 1, Research Question 2 What is the difference between the performance of male and female students taught using Polya Problem-Solving Model? Table 3. 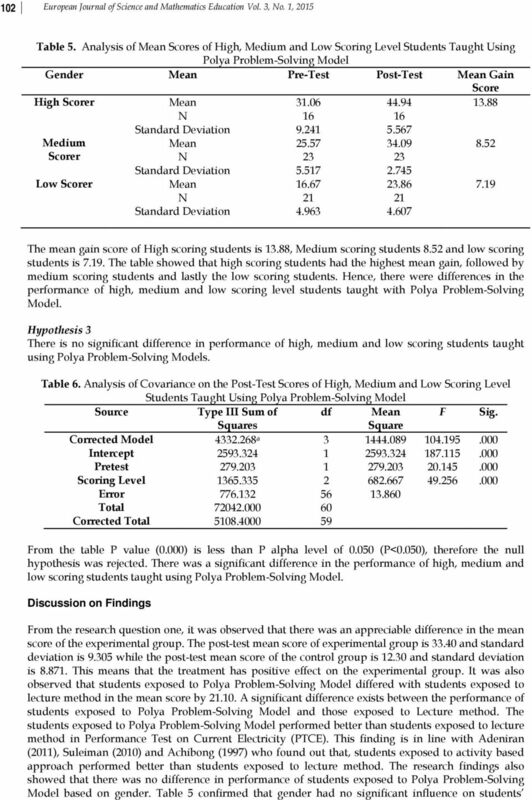 Analysis of Scores of Male and Female Students Taught using Polya Problem-Solving Model Gender Pre-Test Post-Test Gain Score Male Female The table 3 presented the mean score of students exposed to Polya model based on gender. Male students had pre-test mean score of and standard deviation of while female students had pre-test mean score of and standard deviation of The difference between the mean gain score of male and female students taught with PTCE is Hypothesis 2 There is no significant difference between the performances of female and male students taught using the Polya Problem-Solving Model. Table 4. Analysis of Covariance on the Post-Test Scores of Male and Female Students Taught Using Polya Problem-Solving Model Source Type III Sum of df F Sig. Squares Square Corrected Model a Intercept Pretest Gender Error Total Corrected Total Table 4 showed the result of Analysis of Covariance on the post-test mean scores of male and female students taught with Polya Problem-Solving Model. P value (.951) is greater than P alpha level of 0.05, (P>0.050), the null hypothesis was not rejected thus there was no significant difference in the performance of male and female students taught using Polya Problem-Solving Model. This is related to the result of mean gain score in Table 3 the close margin of 0.56 between the mean gain scores of male and female students taught using Polya Problem-Solving Model Research Question 3 Is there any difference in performance of high, medium and low scoring level students taught using Polya Problem-Solving Model? 7 European Journal of Science and Mathematics Education Vol. 3, o. 1, performance in Performance Test on Current Electricity (PTCE). This finding is in line with Agbayewa (1990) found out that there was no significant difference between post-test mean scores of male and female students in the Physics achievement test. The research also showed significant difference in the performance of high, medium and low scoring students taught using Polya Problem-Solving Model. This is also in agreement with the findings of Adeniran (2011). Conclusion Polya Problem-Solving Model enhanced better performance of students exposed to current electricity. The model also enhanced better performance among male students. It was also confirmed that the model enhanced better performance of students irrespective of their scoring level. Recommendations Based on the research findings, the following recommendations were made; 1. The use of Polya Model should be encouraged during teaching and learning of Physics in Senior Secondary School since it enhanced better performance of students irrespective of the scoring level. 2. The pre-service physics teachers should be exposed to Polya problem-solving Model during their training. Efforts should be put in place to organize training and re-training programme on Polya Problem-Solving Model in Physics for practicing teachers. 3. Text-Book authors should endeavour to incorporate the Problem-Solving Models of teaching while writing new editions. This would encourage the use of the models by both teachers and students. References Achibong, A.U., (1997). The relative effectiveness of activity based and lecture method on the cognitive achievement of integrated science students. Journals of Science Teachers Association of igeria, 32 (1&2), Adegoke, A. O., (1990). Effects of Polya and Six-Stage heuristic problem-solving instructions on students achievement in secondary school mathematics. Unpublished Ph. D. thesis, University of Ilorin, Ilorin, igeria. Adeniran, S. O., (2011). Effects of two problem-solving approaches on senior school students performance in physics in kwara state, igeria. Unpublished Ph. D. thesis, University of Ilorin, igeria. Agbayewa, J. O., (1996). The effects of enhanced problem solving instructional strategy on students concept learning in secondary school physics. Research in curriculum studies. Journal of the Curriculum Studies, 1 (1), Ayodele, A. F., (2002). Obstacles to the effective teaching and learning of chemistry at the secondary school level: Curriculum implications for sustainable educational development. Science Teachers Association of igeria. Proceedings of the 43rd Annual Conference and Inaugural Conference of CASTME Africa, igeria: Heinemann Educational Books PLC. Bransford, J., and Stein, B., (1984). The ideal problem solver: A guide for improving thinking, learning and creativity. ew York: W.H Freeman. (accessed 2007) DeMuth, D., (2007). A logical problem-solving strategy. Retrieved March 2007 from Higher Education. Esiobu, G. O., (2007). Gender issues in science and technology education for development. In Ivowi U. M. O. (Ed). Science and technology education for development. Lagos: Adecos Education Science Ltd. Galadima, I., (2002). The relative effect of heuristic problem-solving instruction on secondary school students performance on algebraic word problems. In J. Sadiku (Ed). Abacus Mathematics Education Series. The Journal of the Mathematical Association of igeria (MA), 27 (1). Gick K., (1986). Problem solving process, in principles for teaching problem Solving. In Foshay and Kirkkey (Eds). ew York: Plato Learning Inc. Lester, F. K., (1980). 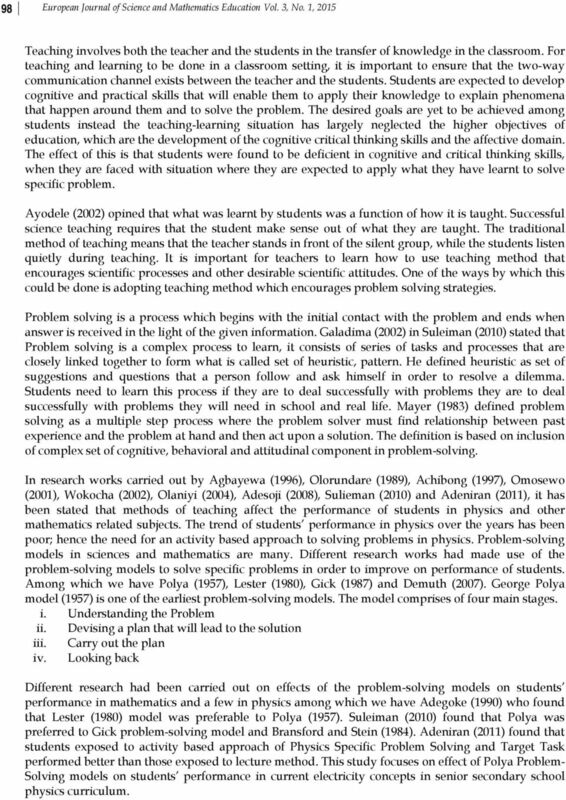 Issues in teaching mathematical problem solving in the middle grades, school science and mathematics, (accessed May 2012) Mayer, R., (1983). Thinking, problem-solving and cognition, ew York: W. H. Freeman and Company. Olorundare, A. S., (1989). An investigation into the difference between men and women in science. Ilorin Journal of Education 9, Omosewo, E. O., (2001). Kwara state school female images of the physics. Women in science technology, and mathematics education in igeria. Proceedings of the 42nd Annual Conference of Science Teachers Association of igeria. igeria: Heinemann Education Books PLC. Omosewo, E. O., (2001). In-service programme for senior secondary school physics teachers for improved teaching and assessment of students. igerian Journal of Development Issues: Education, Socio-political and Economic Development. 5 (1&2), Polya, M., (1957). How to solve it, 7-9. ew York: Double Day. Suleiman, B., (2010). The effect of Polya, Gick and Bransford and Stein problem-solving models on students performance in statistics word problems. Unpublished Ph.D. thesis, Department of Science Education, University of Ilorin, Ilorin, igeria. 8 104 European Journal of Science and Mathematics Education Vol. 3, o. 1, 2015 Wokocha, G., (2002). Fundamental competency defiance among Integrated Science Teachers: Implication in science, technology and mathematics education. Science Teachers Association of igeria, Proceeding of the 43rd Annual Conference and Inaugural Conference of CASTME Africa, igeria: Heinemann Educational Books PLC.